The Syrian Arab Army on Saturday resumed its national duty in hunting the armed terrorist groups, killing many of them and destroying their criminal equipment. A military source told SANA reporter that a unit of the army destroyed a car loaded with weapons and ammunition in Daraa countryside. The source added that a terrorist gathering was razed to the ground and various ammunition and weapons were destroyed. An army unit eliminated an armed terrorist group in Tal al-Mahas and destroyed their criminal tools. 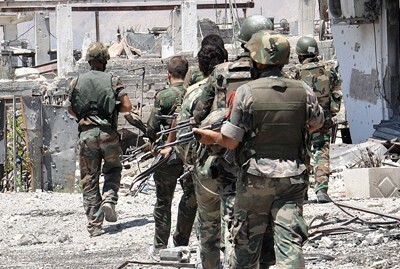 Units of the army eliminated armed terrorists groups in al-Qboun neighborhood and other areas in Damascus countryside. An official source told SANA reporter that three terrorists were killed in al-Qaboun in clashes with an army unit in addition to killing 5 other terrorists in Jobar. The source added that units of the army eliminated members of an armed terrorist group in Harasta and destroyed their weapons and ammunition. In al-Qassemia farms, an army unit clashed with an armed terrorist group and killed 10 terrorists. A military source told SANA reporter that the army eliminated members of an armed terrorist group in Adra and destroyed a car loaded with weapons and ammunition in Deir Attia in Damascus countryside. Units of the army eliminated armed terrorist groups and destroyed a number of dens and an anti-aircraft machinegun in Homs neighborhoods and towns. A military source told SANA reporter that members of an armed terrorist group were killed or injured in al-Warsha and al-Hamidieh neighborhoods amd al-Dar al-Kabira village. An official source said that the competent authorities eliminated 20 terrorists in al-Shomaria Mountains in Homs countryside and destroyed an anti-aircraft machinegun and various ammunitions. Units of the armed forces confronted armed terrorist groups’ attack against Aleppo central prison and the citizens in some safe neighborhoods in the city of Aleppo and destroyed rocket launcher pads and mortars in Aleppo countryside. A military source told SANA reporter that terrorists’ gatherings were destroyed in the villages of Tal Hasel, Tal Irn and South-East of al-Nirab, and their vehicles, weapons and ammunition were also destroyed. The source added that an army unit clashed with armed terrorist groups of the so-called “The Islamic State in Iraq and Sham” affiliated to al-Qaeda which attacked Aleppo central prison, killing and injuring their members. The source said that rockets’ launcher pads, mortars, heavy machineguns were also destroyed in addition to terrorists’ hideouts in the villages of Tal Dana, al-Jadideh and Kwairis in Aleppo countryside. A big number of terrorists were also killed. In Aleppo city, Units of the armed forces foiled terrorists’ attempt to infiltrate to al-Sayyed Ali neighborhood and the cemetery near Hanano barracks, killing all of them and destroying their weapons. Meanwhile, a military source told SANA that units of the armed forces carried out a series of operations in the villages of al-Hamidieh and the surrounding of Wadi al-Daif in Idleb countryside, destroying dozens of tunnels with all weapons and ammunition inside them, killing all terrorists inside them. The source added that terrorists’ attempt to remotely detonate 11 explosive devices, weighing between 25kg to 50 kg planted in the area surrounding Wadi al-Daif was foiled. Army units eliminated all members of armed terrorist groups and destroyed their weapons and ammunition north of Abu al-Dohour airport, Kfer Nibul, Majdalia and Serja in Idleb countryside. This entry was posted in +AAArchive, Syrian Arab Army, Terrorists, Terrorists killed, War Against Terrorism and tagged foreign mercenaries, foreign-backed insurgency, foreign-backed terrorists, Free Syrian Army, Jabhat al-Nusra, Syrian Arab Army, Syrian Army, Syrian Patriots, Syrian Resistance, takfiri, Takfiri movements, Terrorisme, Terrorist attack, Terrorist killed, Terrorists, Terrorists Gangs, Terrorists surrender, War against Syria, War Against Terrorism, War Criminals, War on Syria, Zionist conspiracy by syrianetwork. Bookmark the permalink.